FILE - Facebook CEO Mark Zuckerberg testifies before a House Energy and Commerce hearing on Capitol Hill in Washington about the use of Facebook data to target American voters in the 2016 election and data privacy, April 11, 2018. 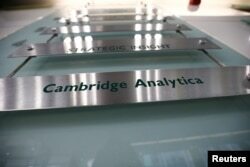 Facebook is being investigated by lawmakers in Britain after consultancy Cambridge Analytica, which worked on Donald Trump's presidential campaign, obtained the personal data of 87 million Facebook users from a researcher, drawing attention to the use of data analytics in politics. Concerns over the social media giant's practices, the role of political adverts and possible interference in the 2016 Brexit vote and U.S. elections are among the topics being investigated by British and European regulators. "We've never seen anything quite like Facebook, where, while we were playing on our phones and apps, our democratic institutions... seem to have been upended by frat-boy billionaires from California," Canadian lawmaker Charlie Angus said. "So Mr. Zuckerberg's decision not to appear here at Westminster [Britain's parliament] to me speaks volumes." Richard Allan, the vice president of policy solutions at Facebook who appeared in Zuckerberg's stead, admitted Facebook had made mistakes but said it had accepted the need to comply with data rules. "I'm not going to disagree with you that we've damaged public trust through some of the actions we've taken," Allan told the hearing.